TRIVIA of Noh : Q106 :Does the term "shibai" come from Noh? | Home | Trivia | Q106 : Does the term "shibai" come from Noh? Does the term "shibai" come from Noh? Some terms used casually in everyday life are derived from the world of Noh and Kyōgen. "Shibai" (drama) is a good example. In the Muromachi era, Shinto rituals known as Okina and forms of public entertainment such as dengaku and sarugaku were performed in the grounds of temples and shrines, where it was easy for people to gather. People watched plays sitting on a lawn because there were no seats. 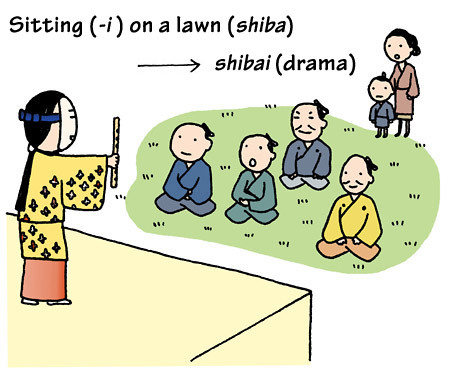 The term "shibai", a compound of "shiba" (lawn) and "-i" (sitting), is believed to have come from this. The expression " shibai ga haneru" is used to say that a performance is over. "Haneru" is a variation of "hane-ageru", which literally means "to jerk something". At one time, fences of straw mats were erected around performances so an admission fee could be charged. The term "haneru" was originally used to describe the end of the performance because that was when the barriers were pulled away to get the audience to leave. The term "bangumi" (program), also used now for TV shows, is another that was originally from the world of Noh, where the word was used for an event featuring a Noh play and a Kyōgen play.